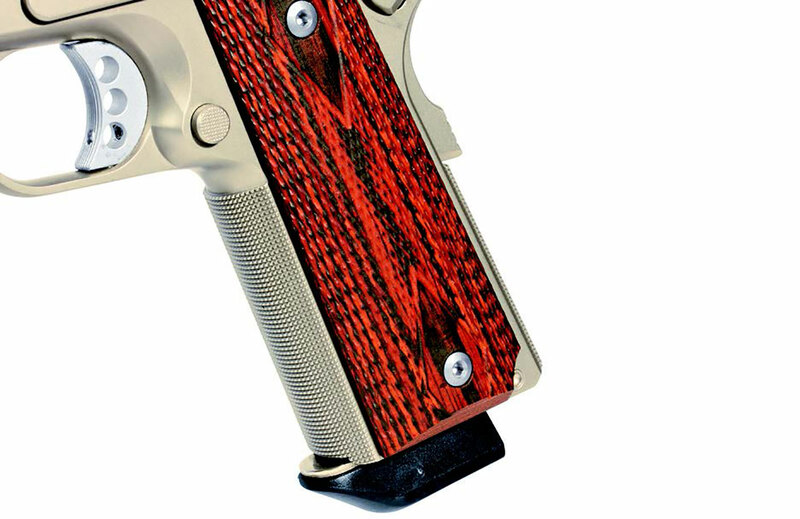 When I hit 50 and decided to buy myself a high-end 1911, I could’ve turned to any number of high-end makers. Back then, Ed Brown himself attended our industry’s big trade show, and I always made a point to visit with him. Mostly we talked about hunting, but over the years, I learned a lot about 1911s from him as well, and that—coupled with knowing how well respected his guns are—made the decision an easy one. The Special Forces I ended up buying was my first exposure to how top-notch craftsmanship makes such a huge difference in how a 1911 feels and shoots. This high quality is at the heart of Ed Brown Products’ Executive Commander, part of the company’s Elite series. The French border and the ball end mill cuts on the frame give this pistol a handsomely distinctive look. If you’re familiar with the Perry, Missouri, gun maker, you know that since it is a custom shop you can choose from an extensive list of options, and I’m not going to dive into any of those because you can look them up on EdBrown.com. The standard Executive Commander is available in .38 Super, 9mm and .45, and it features a 4.25-inch slide with ball end mill cuts and a French border, as well as a flattened and serrated top. The cuts and the border give the pistol a distinctive look, and I didn’t realize how much of a difference they made until I dragged out a few other 1911s and compared them to the Executive Commander. 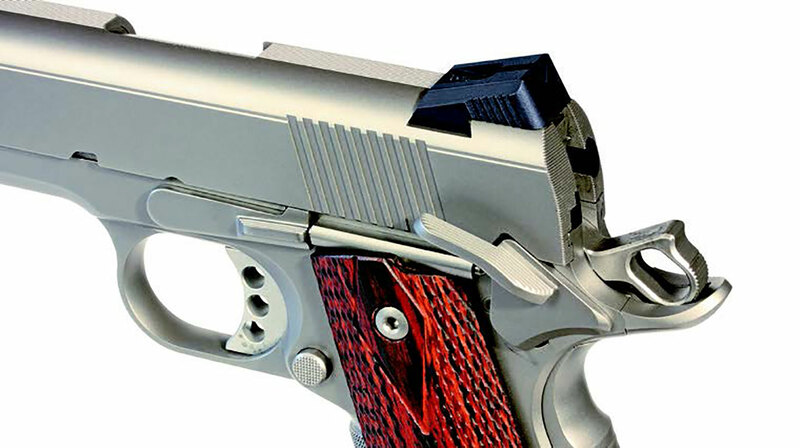 This is one good-looking pistol. The flat-bottom slide serrations are on the rear only. The back of the slide is checkered to reduce glare, a feature I’ve come to appreciate, especially on stainless guns that don’t have any coatings on the steel. 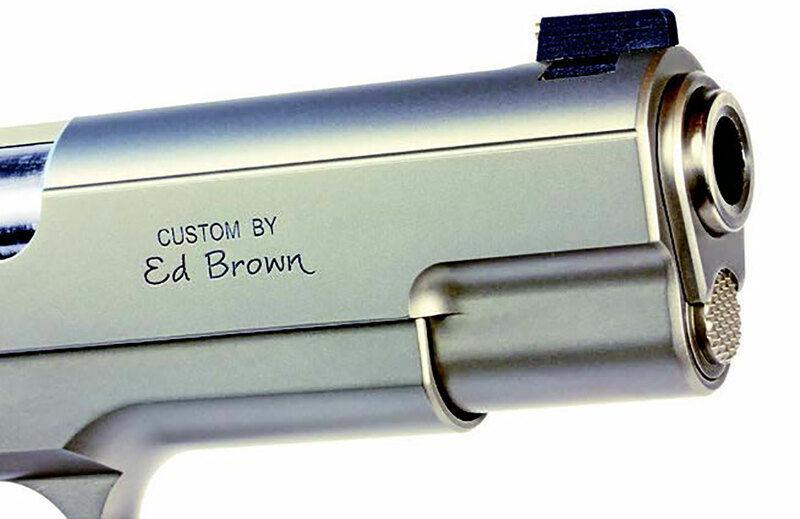 All of Ed Brown’s parts are made in-house, and they’re perfectly hand-fitted. The top of the slide is flattened and serrated, and the back of the slide is serrated as well. The fixed rear sight is installed in a dovetail and secured by a hex-head setscrew. Loosening the screw allows the sight to be drifted easily to adjust windage. The front sight features a brass bead. More on this later. The precision engineering of the gun’s parts—machined in-house—and their hand-fitting by master craftsmen is what you’re paying for here. There’s no play in the slide-to-frame fit, the unramped barrel mates up perfectly with its bushing, the single-side thumb safety works with just the right amount of tension, and the trigger breaks nicely at three pounds, eight ounces on average. The frontstrap and mainspring housing are checkered at 25 lpi. My Special Forces pistol has Ed Brown’s Chainlink pattern on those parts, and it’s fine, but I think I prefer the 25 lpi. The stainless metal is set off nicely with a set of handsome black cherry grips in the traditional double-diamond style. The checkering on the frontstrap and mainspring housing is 25 lpi. The black cherry grips look spectacular against the stainless frame. The gun employs John Browning’s original short guide-rod design. I’m not a fan of full-length guide rods, so this makes me happy. The pistol shoots well, as you can see in the accompanying table. I need to point out one anomaly with the Hornady load, which didn’t average as well as the others. But the thing is, for four of five shots in each group it was actually the best shooting ammunition. For some reason it suffered from “first-shot syndrome,” in which the first round would be well away from the other shots. In this case, it was always low, always by a similar amount. None of the other loads exhibited this tendency. The Executive Commander really shined when running plate racks and shooting drills. I can’t remember when I’ve had as much fun shooting a handgun. The 9mm chambering and the shorter barrel were simply made for one another, and the hits came fast and accurate. I burned through a couple hundred rounds of various ammo types, and the gun never choked. That brass bead front sight paired with the plain black rear is phenomenal for rapid acquisition. The bead was easy to pick up, and the relationship between the blade and the rear notch made for easy alignment. Running it from a Blackhawk MBoss holster (see the review elsewhere in this issue), it drew super-smoothly, and I never had a hiccup with the grip safety—an Ed Brown design with a nicely executed memory bump. And I really appreciate a thumb safety that’s not only easy to deactivate during the draw but also easy to put back on Safe when holstering. The only thing I couldn’t do was work on reloads through the slightly beveled mag well because Ed Brown provides only a single bumpered magazine, and all my 1911 mags are for .45. 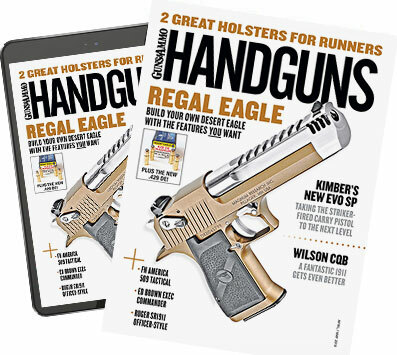 Other writers have called out the company for being stingy with magazines, especially considering the pistol’s high cost, and I have to echo that sentiment. Other than that, I can’t come up with a single gripe. The more I shoot 9mm 1911s, the more I like them, and I think the Commander length offers a terrific balance of weight, power and shootability. And it carries nicely as well. Some readers will complain about the price tag on this particular gun, and that’s fine. 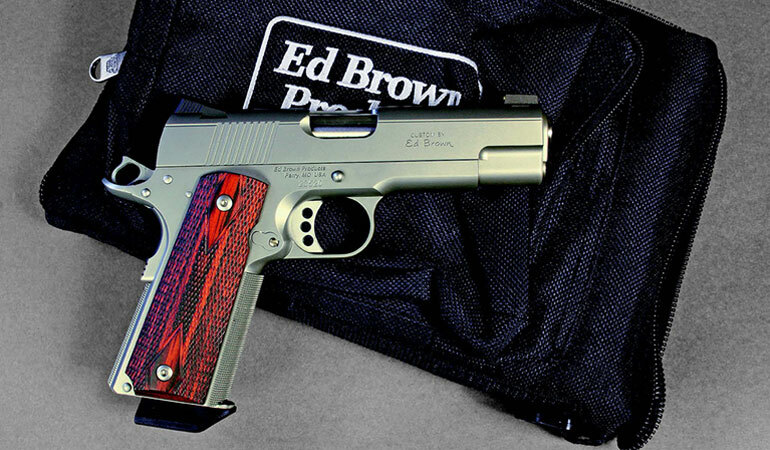 But if you’re willing to make the investment, you’d be hard-pressed to find a better made, better shooting and better handling pistol than Ed Brown’s Executive Commander.